Polystyrene & Expanded Polystyrene Market Size will surpass USD 49 billion by 2025; according to a new research report by Global Market Insights, Inc. Polystyrene (PS) & expanded polystyrene (EPS) market is projected to observe strong demand in insulation and foaming applications in construction sector by 2025. With EPS geofoam, the engineers and architects can develop the ideal blend of materials to deliver the efficient construction solutions. The use of EPS lowers the overall cost of construction and results into benefits to construction schedules since it is easy to handle during construction. The significant applications of the product include: as lightweight fill for construction, slope stabilization, runway and roadway sub-grade insulation, etc., EPS geofoam was used in a planned housing development in the coastal area of Great Yarmouth, UK. The construction segment is likely to have a growth of CAGR close to 5% in PS & EPS market by 2025. Polystyrene & expanded polystyrene market has been facing intense competition in terms of performance, costs and availability in mutually-substitutable applications in the recent years. 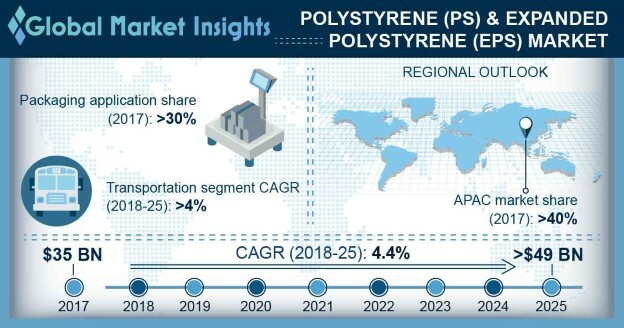 With polypropylene and polyethylene posing as the strongest competitors to PS & EPS, the market growth might be affected negatively in the near future. EPS is expected to have the faster growth with an estimated CAGR of 4.7% during forecast period. Expanded polystyrene has been among the largest commodity polymers produced across the globe. In recent years, EPS has been specified for the first layer of construction in passive building construction. With this EPS usage, an advanced building envelope is achieved for attainting the highest ratings. The packaging segment had more than 30% share in global PS & EPS market in 2017. Polystyrene has been considered as a cost-effective solution for rigid packaging as well as food packaging applications. The product usage in packaging food prevents food spillage and provides thermal insulation during storage of food and refrigerated transportation. These resins reduce weight and cost, and also provide convenience, freshness, information, and the aesthetics essential. The overall PS & EPS market will observe substantial demand in packaging application by 2025. Asia Pacific region observed the highest market share exceeding 40% in the overall polystyrene & expanded polystyrene market in 2017. The huge share was accredited to the substantial growth shown by regional automotive and construction industries. The expanding traits of urbanization and population feeding necessities will drive the regional construction, energy, automotive healthcare and food sectors in the next decade. This in turn present strong potential for PS & EPS demand by 2025. Major manufacturers include: ACH Foam Technologies, INEOS Styrolution, Trinseo S.A., Total S.A., BASF SE, SIBUR, SABIC, Flint Hills Resources, HIRSCH Servo etc. Manufacturers have been participating in strategic mergers & acquisitions in the highly fragmented PS & EPS market. For example, in Sept 2018, SABIC announced the acquisition of a 24.99% equity interest in Swiss Clariant AG. This strategic acquisition will ultimately help the company to diversify its product portfolio and to increase its market share.